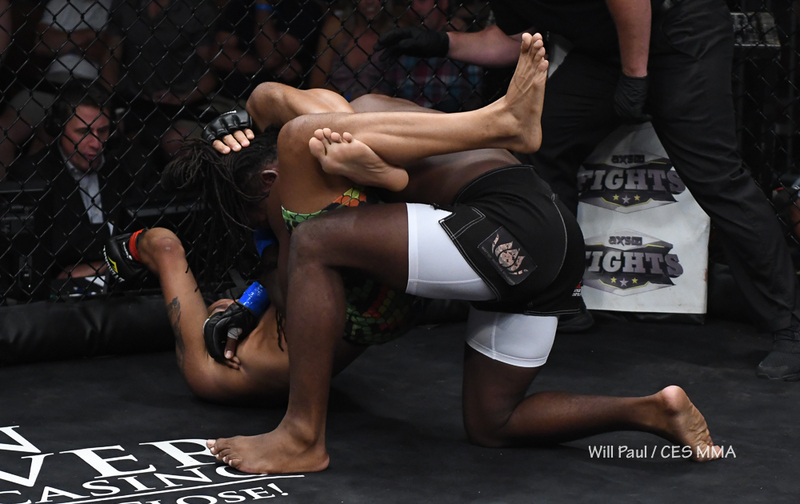 A tight triangle finish brought the welterweight title fight to close in the first round of the main event as Nate Andrews was able to trap D'Juan Owens and get the tap. Main Event - Welterweight Title Fight - Nate Andrews (14-1) caught D'Juan Owens (16-13-1) in a triangle choke to win by technical submission at 1:34 in round one. Co-Main Event - Featherweight Title Fight - Bruce Boyington (16-11) submitted Sean Soriano (11-6) with a rear-naked choke at 1:15 in round two. Bantamweight Fight - Kris Moutinho (6-2) defeated Da'Mon Blackshear (5-2) via unanimous decision (29-28, 29-28, 29-28). Lightweight Fight - Jacob Bohn (7-5) submitted Lewis Corapi (8-4) with a triangle choke at 3:14 in round one. 150-Pound Catchweight Fight - Blair Tugman (11-7) defeated Shane Manley (4-4) via unanimous decision (29-28, 29-28, 29-28).